Interesting site. I have been in the Hinckley factory, pre-2002. I don't like the look of the large UXB in one of the 1940 pics! What is a shame is that you can't enlarge any of the pics. I was also sorry to see that the Meriden factory was demolished; it was a decent building, and a site with good access and location. BLIMEY!! Now that is very nice indeedy! It must have been kept somewhere quite damp free to look like that after all this time. Top marks for finding this one!! VERY sad sight. I bought one of the first batch of T140V (left foot change/rear disc/UK tank) Bonnies that were built there after the opening of the 'Co-op', from Albany Motorcycles. Happy days. Slightly veering off from the main topic but relevant to both Triumph and Coventry here are two photo's of the Coventry LMS goods yard. 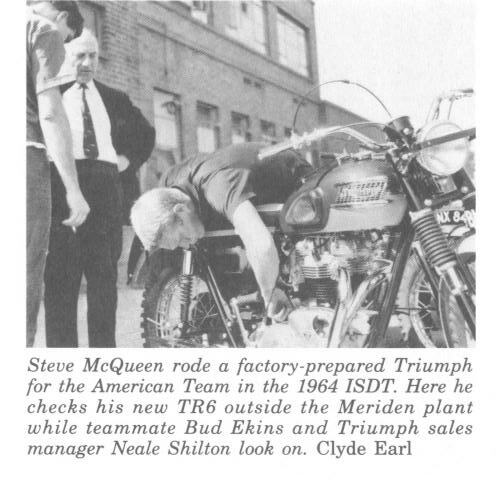 I have a passion for both Railways and Triumphs (esp my Tiger 100 ) Triumph 'Outfits' (sidecar combinations) being loaded at Coventry's LMS goods yard, the place they now call 'Central 6' for some reason ? Loaded Triumphs coming out of Coventry goods yard (Central 6) onto the main 'up' line.You can just about see 'Anarchy Bridge' in the background, now replaced by a new bridge section. The engine maybe a 2F/3F Midland 'Johnson' class. Hello Dutchman, Funnily enough these photos used to hang in 'The Old Dyers Arms' where the Antelope now meet.When the landlady Mavis? left and Pete Reeve took over many years ago he lent us the originals and we had them scanned, I'm not sure if they still hang up in the bar but there used to be others of this area (Spon End /Old Chap), also another place that had lots of images was 'Stantons' the barbers on AOR, when the old boy was ill one day I had to go into the women's bit on the left hand side of the shop to get my hair cut and there was a wall covered in local images from years ago, I've always wondered what happened to them. Found this image from the 1956 Triumph Catalogue (French Dealer) showing Broadgate. Here is my Triumph 3TA , reunited with the road again this week after spending 27 lonely years in boxes and wrapping. A testament to the men at Meriden who first made her in 1963. Just waiting for the weather to improve before road testing. Nice to see another Triumph on the road 'Herberts Lad' I had several 3TA's,T90's,T100's, I like what they called the 'C' range unit construction, alas I only have 2 now, a 1964 T100ss and a 1969 T100c that I'm building up. Here is the 64 Tiger 100ss outside what would have been the original Triumph factory, And here is my 69 Tiger 100c being built up (slowly).